Home · Posts tagged "Special Olympics"
Recent news about rich parents gaming the system to get their offspring into the “right” colleges has spawned conversations about the state of things in America. I, of course, have my two cents to add to the discussion, especially where sports are concerned. Sports were one of the avenues to acceptance that the offenders employed to get their over-privileged darlings into elite schools- doctoring photos , generating fictitious resumes and bribing coaches. As if collegiate sports were not tainted enough already. Which led me to ponder, is there any purity left in sports at all? Money and politics run college sports- that we know. And even at the secondary level, for every high school athlete who shows even a modicum of promise, there is a parent- advocate pushing to position their child for a college scholarship. And, sadly, even youngsters can’t play a stress free game without “encouragement” from the stands. At my home town Little League field, years ago officials moved the bleachers from behind home plate out to center field where shouted criticisms from parents were less disruptive. So, is there any place where a game can be played simply for the joy of it? I suggest that there is. 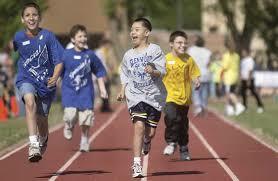 Special Olympics creates opportunities for athletes with intellectual disabilities. There are 12,000 in Connecticut alone competing year round in 28 different sports. They train to win, of course, but their focus is to do the best they can and enjoy the process. And part of Special Olympics is Unified Sports which partners Special Olympians with elementary, middle and high school students to train and play together in friendly competition. And here’s another area where sports are played for the best of reasons. When and wherever everyday folks gather to play for someone else’s benefit. To me that is sport at its most noble, and the pages of sportingAcause.com are full of them. The Penguin Plunge is a wintertime fundraiser for Special Olympics Connecticut. Participants (“Penguins”) of all ages register and get pledges and then join with others, either as an individual or as part of a team, to jump into the cold water for fun and a great cause! Entrants, who must be 8 years old or more, are asked to raise a minimum of $100 each to participate in the Penguin Plunge, but there are great incentive prizes for those who meet higher fundraising levels. 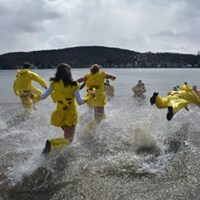 Those who do not want to take the plunge can still participate in the fundraising effort. Entrants are asked to raise their funds early enough to bring them the day of the event. Register online at give.classy.org/winstedplunge for a free event T shirt. Costumes are encouraged. Get a printable registration form at soct.org. 1:00 pm Awards for fundraisers, best costumes and other festivities. The money raised through Penguin Plunges benefit over 12,000 athletes and Unified Sports® partners state-wide who participate year-round in 27 different sports training and athletic competitions for children and adults with intellectual disabilities and their peers without disabilities. The Penguin Plunge is one of the largest fundraising efforts for Special Olympics Connecticut. For more information call (203) 230-1201 ext. 270 or email jeffreyv@soct.org. For more information about Special Olympics CT visit soct.org.